Israeli soldiers attacked, on Saturday evening, a Palestinian park near the Tahadi 5 School in Beit Ta’mar village, east of Bethlehem, in the occupied West Bank, and fired gas bombs and concussion grenades. Hasan Breijiyya, the head of the Bethlehem office of the National Committee against the Annexation Wall and Colonies, said a large military force invaded Job al-Theeb community, especially the area surrounding the Tahadi 5 School. He added that the soldiers tried to invade the park, but the locals stopped them, before the army started firing gas bombs and concussion grenades. The attack was the second on the same day, as the soldiers invaded the park, on Saturday at noon, and tried to confiscate slides and swings, but the presence of an international delegation prompted them to withdraw. 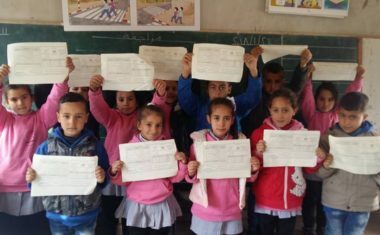 This past Thursday, the soldiers invaded Beit Ta’mar, and started firing live rounds at students, teachers and officials of the Ministry of Education, during a celebration in the school.